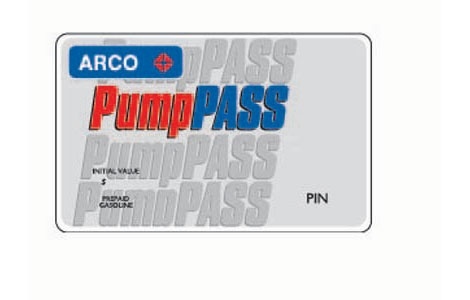 When you're in a hurry—as we all are sometimes—the ARCO PumpPASS card is a great and easy service to use. All you have to do is select a pump on the PayQuick island terminal, insert your pre-paid PumpPASS card, then begin fueling. But that's not all. PumpPASS cards also are a convenient way to control expenses for your business or family. Purchase a card for yourself or several cards for friends or employees. ARCO Gift Cards can only be used for purchase at participating ARCO locations in the US. Use of the ARCO Gift Card is subject to the terms and conditions printed on the cards. ARCO is not affiliated with National Gift Card, nor is ARCO a sponsor or co-sponsor of this promotion. The ARCO name and logo are registered trademarks of ARCO p.l.c.